After nearly a year stuck on land (ugh!) we are happy to announce we are liveaboards again! 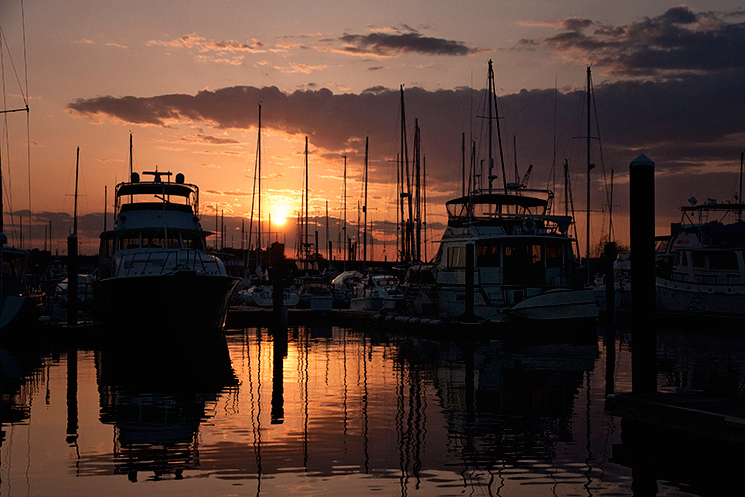 We knew we really missed this life, but it wasn’t clear just how much until we were happily bobbing and swaying along as the sun set over the marina. I think timing has definitely played a big part in our ear-to-ear smiles. We really couldn’t have picked the more perfect time of year to do it. 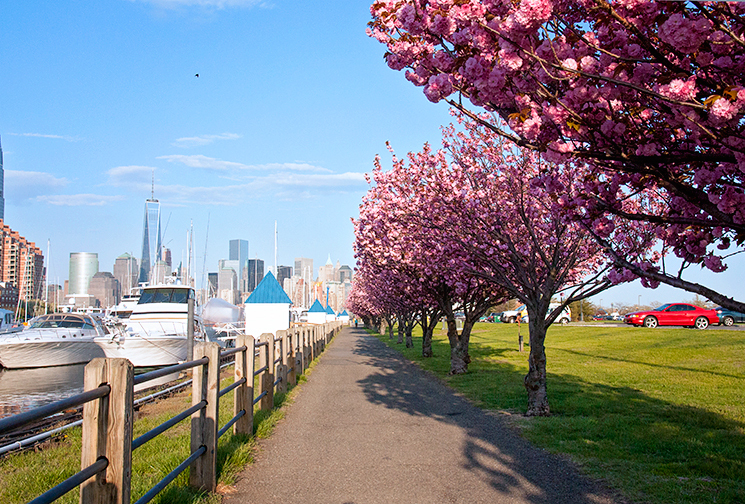 After a winter that would not end, the weather is finally hitting the 80s and all the cherry blossom trees and tulips are in full bloom. 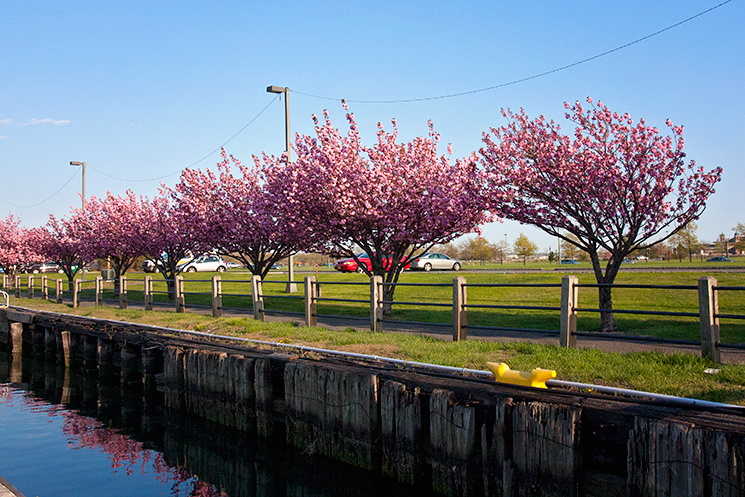 Liberty Landing Marina is truly spectacular in the spring! Seriously, every morning I wake up and think how lucky I am to have this as my view each and every day. All the docks have individual gates and key cards. 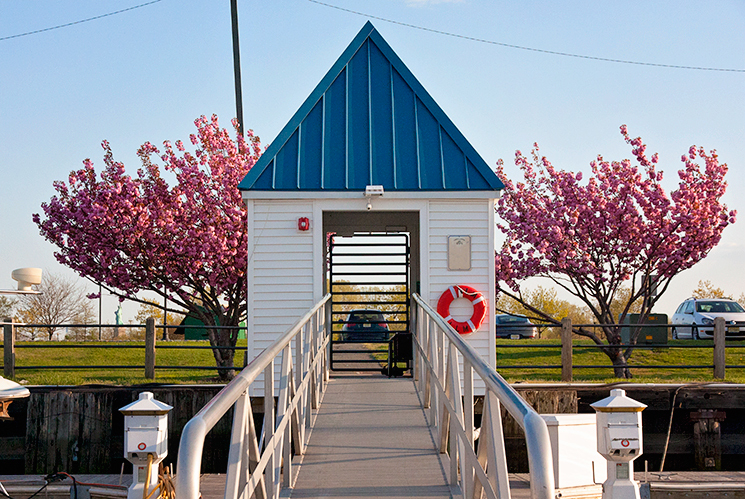 Makes mingling with other boaters a bit challenging, but we definitely feel safe. 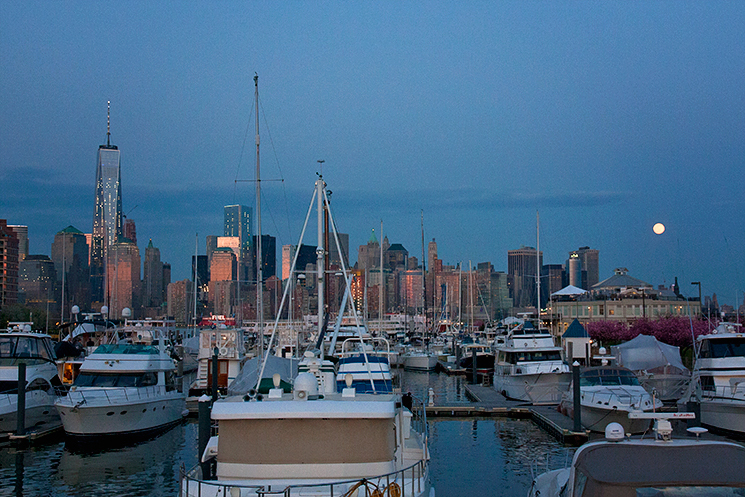 The NYC skyline view from our marina. Doesn’t get better than that! 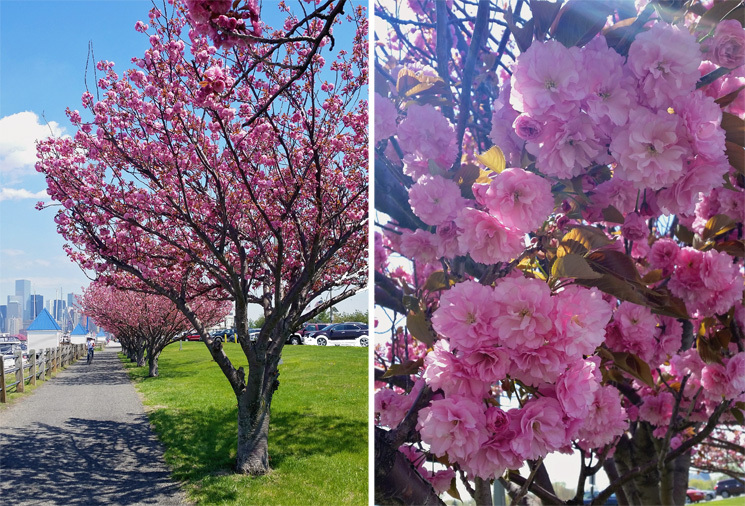 Cherry blossoms just make me so happy! The dogs are loving it too. They just seem happier. The marina is full of fluffy dog friends for Dewey and Riley to play with. There is a big open field just outside of the dock that they can run around and chase each other on. There may not be as many things for them to look for in the water as when we were down south, but they certainly are enjoying all this fresh air and people watching. While we’ve lived aboard before, working full time and living aboard is very new to us. Dirt under my finger nails during the week just isn’t going to cut it. We’re happily adjusting to the new challenge though. Both of us even seem happier getting up for work on Monday mornings now. Our moods may change come winter, but for now it is hard to get the smiles off our faces. Taking the ferry to work sure beats a crowded subway every morning. Jason’s commute is only 15 minutes! Our temporary digs, a powerboat named Big Kahuna. While we wait for our boat to arrive, we’ve been staying on a big ole powerboat. The Big Kahuna is bigger than our apartment back in Brooklyn. She has a king size master bed with jacuzzi shower and multiple levels of outdoor space. We had our friends over the other night just because the weather was gorgeous and it was so nice to sit outside and just enjoy going up and down the different decks. I’ve really been enjoying Liberty State Park which is literally right outside more door. Riley and I head out some mornings for a run and a sunrise show. Life has really been spectacular. 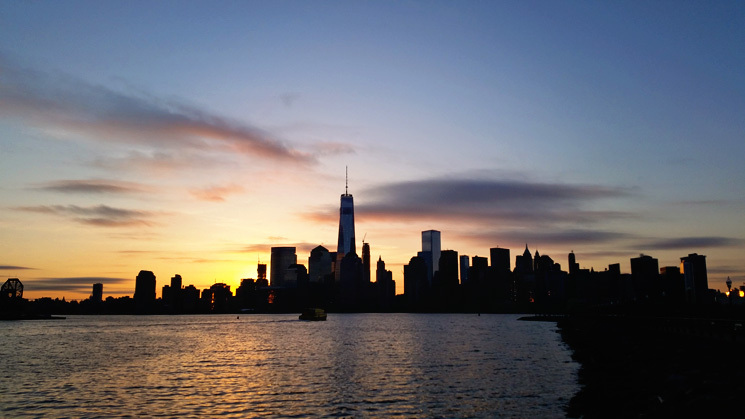 Stunning sunrise view over Manhattan. Full moon rising over Manhattan. How come moons never look as big on camera as they do in person? Looks like an amazing place to liveaboard! Loving the cherry blossom trees. Looking forward to seeing pictures of your new boat once it makes it way up there and settles in with you guys aboard. Hello neighbor. 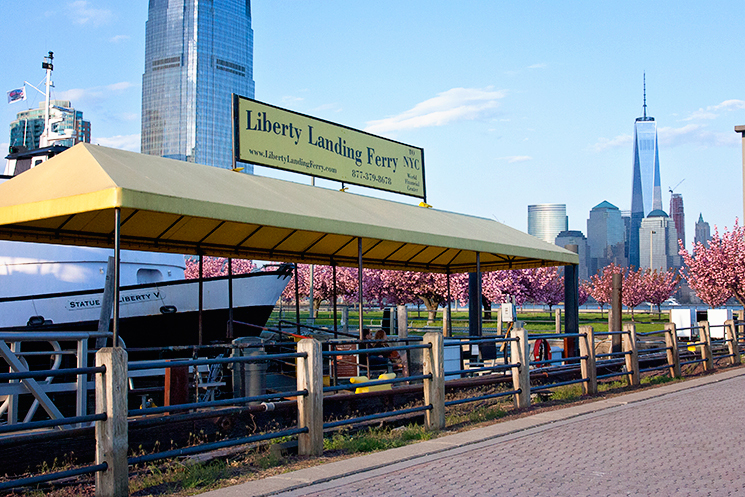 Welcome to Liberty Landing. We’re on F Dock. Will look out for you around the marina. 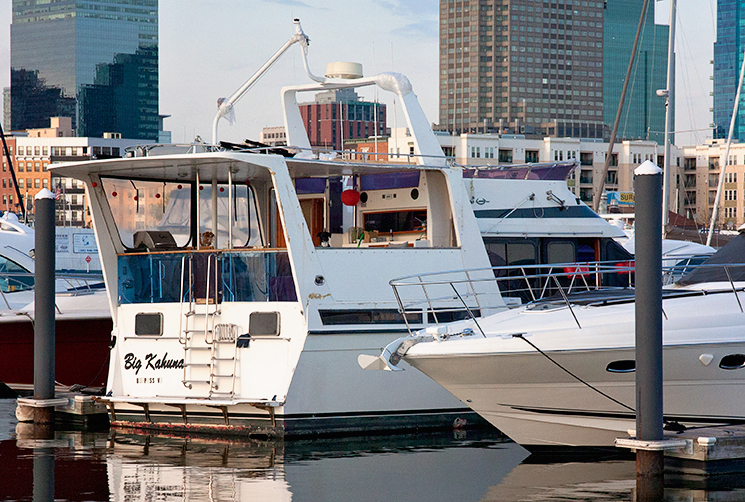 Your new boat (the Vagabond) looks beautiful. Hey welcome aboard with my wife and my daughter and I live aboard we are in J Dock. Stop by sometime! Congrats! 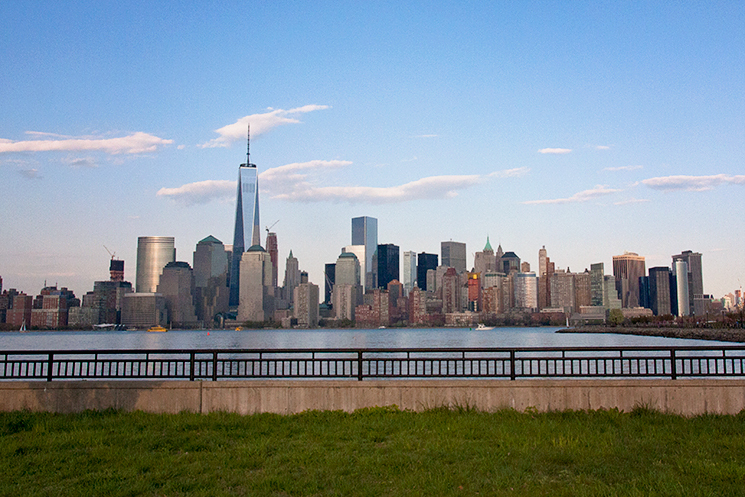 Love the view you have of the NYC skyline – and you can’t beat a 15 commute in the city!